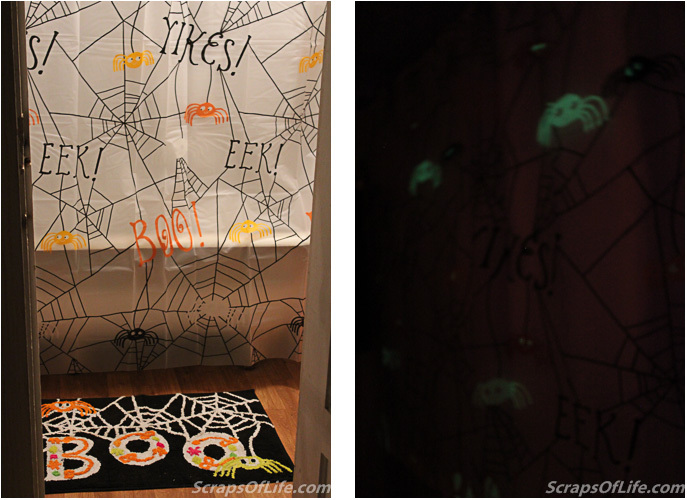 There’s one more room we decorated for Halloween that I haven’t shown you, yet! 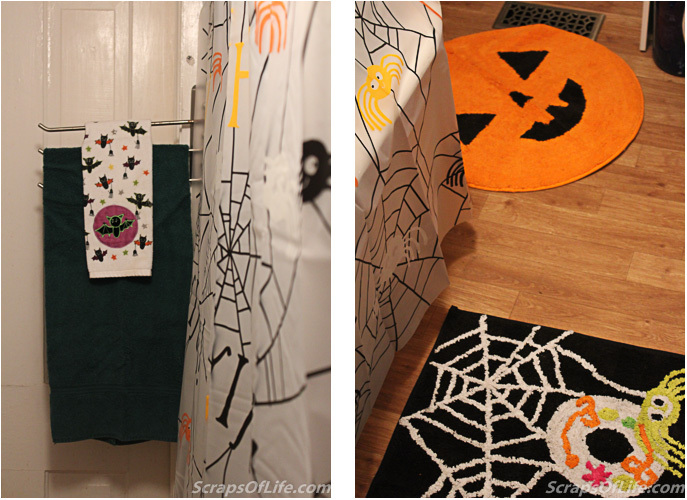 If you watched my Boots, Boots, Boots Shopping Haul video, you saw the cute Halloween bathroom textiles I ordered from Kohl’s. With such a small space to work with, adding decorations didn’t sound like a great idea. Instead, I replaced the items that would otherwise be there with seasonally appropriate awesomeness. Slipping on a new shower curtain might be a tiny bit tedious, but I think it’s worth it to liven up the space a bit. And can I just give some kudos to my new DSLR that allowed me to actually get a picture of the glow in the dark shower curtain details?! That cute little spider soap dispenser sits so prettily on our narrow sink ledge and also glows in the dark. Unfortunately it’s slightly more pretty than functional–more soap comes out of the neck of the bottle than the dispenser tip! Next year it’ll probably be relegated to a pretty shelf decoration (unless I figure out a way to fix the seal on the cap!). As much as I’m not a fan of spiders in real life, they seem to be a natural fit for Halloween–same with the bats. We already had the bat hand towels from a previous year (and some are carrying little spiders through the air), but I think they go pretty well with the new curtain and mats. This was such a simple way to dress up a small room for the holiday, I’m tempted to keep doing it. I’m not sure there’s a lot of call for Thanksgiving shower curtains, but I’m sure I can find some for Christmas! Have you ever (or would you ever) swapped the everyday bathroom bits for seasonal ones? I LOVE that spider soap dispenser! Maybe you could use pipe thread seal tape to fix it?? We do have teflon tape on hand, it’s definitely worth a try! Oh this is really cute! I don’t usually swap things out like this for the seasons, but I bet my kids would LOVE this! I’m ashamed I didn’t think to do it before! Yes, I bet the kids would definitely love it! A trip to Kohls and it can, lol! This is so cute! I think the rugs are my favorite part! I think the soap dispenser is mine. The little glowing eyes! So cute! I do dress up my bathrooms for Christmas! I swap out pictures, towels, candles, soap dishes. Love the seasonal looks! I think I’ll definitely do something to the downstairs bath for Christmas! How cuuuuute! Ok, you’re definitely better than me if you go all out and change your whole bathroom! So fun!! It was a remarkably simple change, Jaclyn, but made such a big difference! Oh this is so cute! And so easy! It really was–I’m ashamed I didn’t think of it before! This is so much fun! My daughter would love it! Oh, it would be great for a kid’s bathroom! So cute and festive! I love the shower curtain! My daughter loves when I do those little things in her bathroom or room. I even put a little tree in her Barbie house last year. Well, her Elf on the Shelf did. Lol. Oh my gosh, that’s the cutest thing ever. I didn’t think about decorating my bathroom, but I’m definitely doing it to my guest bathroom next year! 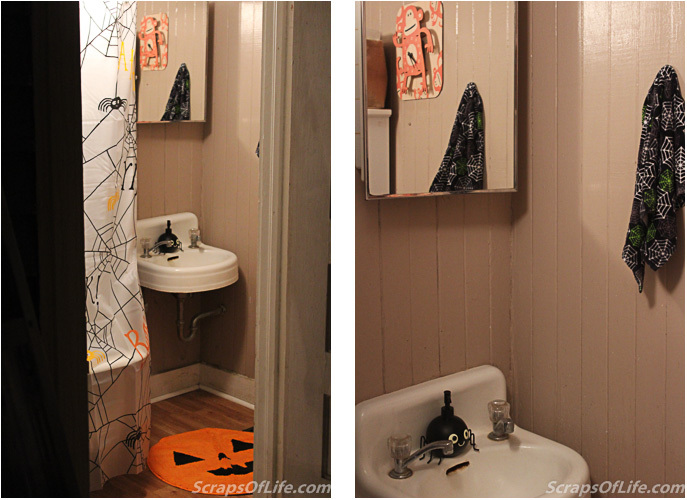 This is our guest bathroom, downstairs–we didn’t decorate anything upstairs this year. This is adorable! I never would have thought to makeover my bathroom for the holidays. Why have I never thought of that before now? I know, right?! But now you’re thinking about it! That looks great! I’ll have to decorate my bathroom this Saturday! That’s right, it’s not too late! Awww… It looks cute! I’ve never decorated my bathroom for holidays! This was the first year I did more than put out seasonal hand towels, but I really like it! That shower curtain is adorable!! Would look great in our house! Thank you! I think it would look good in anyone’s home! Thanks, Roxanne! It is pretty fun–certainly brightens up the absolute worst room in the house. I love how it turned out. The spider soap dispenser is too cute. What a fun way to get into the spirit of the season! Ive never thought of decorating my bathroom! Thank you, Erin, we’ve enjoyed it this month!